Prior to my long blog posting hiatus, I had a 40 x 20 Back to Eden garden in my backyard. I loved the beauty of the garden. The wood mulches gave it such a natural landscape and also kept the soil most and teeming with biological activity. However, after several seasons, I started to realize some of the drawback of the Back to Eden approach. I will detail these in a future post. In an effort to solve some of the problems, I decided to combine the Back to Eden approach with raised bed square foot gardening. This gave birth to version 2.0 of my Back to Eden Garden which has now been in place for three years now. I love the efficient use of space in this garden design. It more than doubles the amount of growing space while sharing the same footprint as the old garden. The beds also make it very easy to follow the square foot gardening approach for plant placement and spacing. Best of all, the garden look like the work an artistic engineer rather than the disorganized chaos that I often see in other gardens. I’ve been using this garden for the past couple of years and still think that it is the best design to maximize the growing space in the southeastern 40 feet x 20 feet section of my backyard. After a whole winter of no plantings, I’ve been eagerly awaiting the coming of Spring so I can put finally put my garden to work. Last weekend, to my delight, I found tomato and pepper plants at Costco. 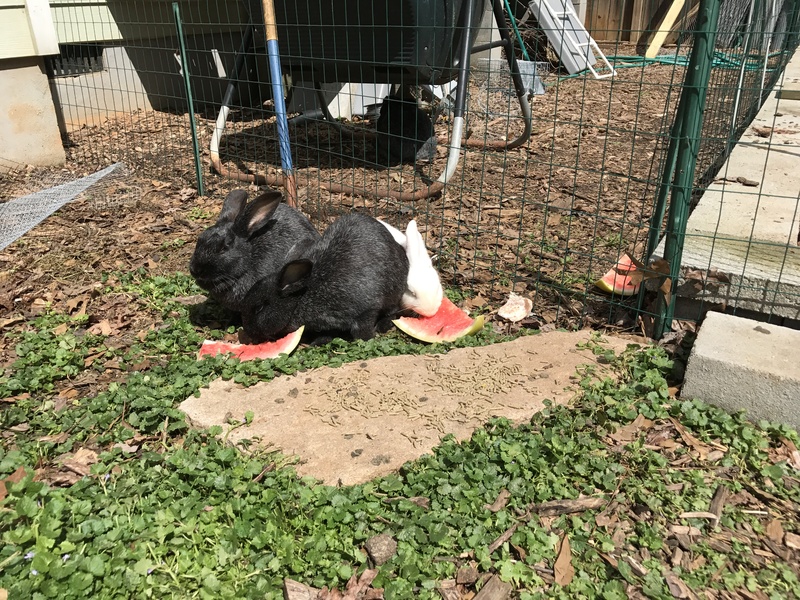 They became the first addition to my Spring garden. While the garden makeover did solve many problems, I have still continued to struggle over the past couple of years with squirrels plundering my crop. They seem to love everything in the cabbage family, including cabbage, collard, broccoli, cauliflower, and kohlrabi. And their hunger became even more ravenous during the winter when their natural food supplies are low. I got so discouraged at seeing beds of new planted seedlings destroyed in just days that I gave up growing these crops completely. This weekend while visiting Home Depot, I saw that they were fully stocked on all of the squirrels’ favorite delicacies. I decided to give it a go again. I purchased and planted close to 50 of these seedlings. To protect the cabbage family seedlings from the squirrels, I constructed four chicken-wire covered tunnels of 4 foot length. 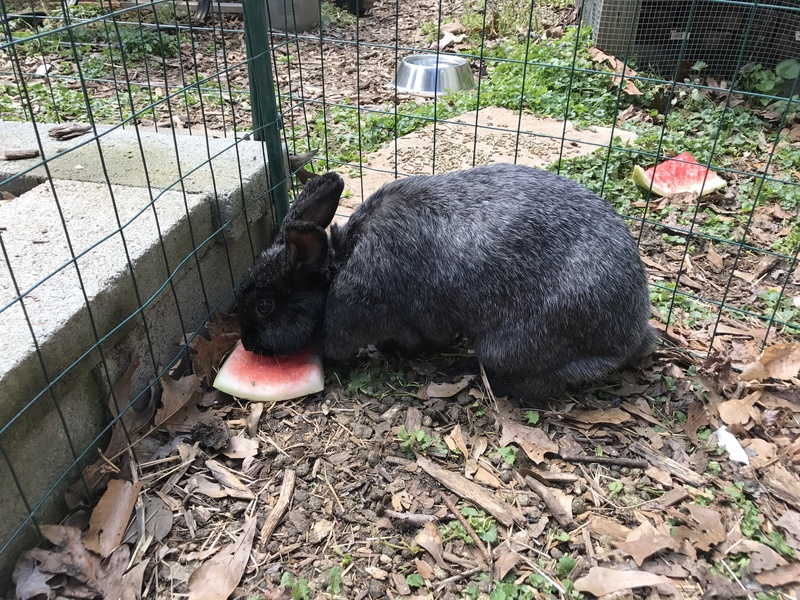 After the hard work was done, I shared a well-deserved watermelon snack with the free-range bunnies.